The Make ICT Fair Market Engagement Series continued with a Meet the Buyer event in Barcelona, 27th February at Pati Manning. The half-day event draw in over 30 participants ranging from ICT suppliers and resellers such as Telefonica or Saytel, NGO representatives and public procurers. Back-to-back with the Mobile Social Congress, the event enabled the discussion around social responsibility in the ICT supply-chain starting at the mining stage. Procura+ Participant, Barcelona City Council kicked-of the event by introducing the audience to the overarching vision and purpose behind leveraging public procurement to increase the engagement with the topic. Namely, to address poor working conditions and human right violations in this global, complex supply-chain. A presentation by Electronics Watch built on the introduction by providing further context as in show casing successful examples where socially responsible procurement made a lasting impact on the welfare of workers. However, the focus of the event was the exchange between suppliers/resellers and the public authorities. This was facilitated for example by an introductory presentation of HPs social responsibility policies, a panel discussion and open floor Q&A. Looking ahead, the next Meet the Buyer event, will focus on an upcoming tender on workplace hardware of Gemeente Haarlem – 15th April 2019, register here to secure a place. Public authorities can now submit their candidacies to the 2019 edition of the Procura+ Awards, a major and prestigious recognition of procurements and related initiatives with remarkable economic, environmental and social impacts, or innovation elements. The Procura+ Awards is an initiative of ICLEI, in co-operation with the EU-funded Procure2Innovate project. The application period is open until 31st March. The awarded public authorities will receive a trophy and have the right to promote themselves with the award title. The rewarded procurement activities will be widely promoted using a wide variety of ICLEI publications and channels. Furthermore, a case study on it will be produced and disseminated in the SP Platform and the PPI Platform. Winners will be granted a free entry and a presentation slot at the next conference organised by ICLEI. There are three categories of the Procura+ Award: Sustainable Procurement of the Year, Innovation Procurement of the Year, and Procurement Initiative of the Year. The winners of the last edition were the Government of Flanders (Belgium), for its framework contract for sustainable office supplies; the City of Rotterdam (Netherlands), for making the city accessible for citizens with special mobility needs, and the City of Barcelona, for implementing a city-wide compulsory sustainable procurement. For more information on the 2019 Awards, and to download an application form, visit the Procura+ website. The biggest successes in public procurement were honoured last week at the EcoProcura conference in the Dutch city of Nijmegen, with a clutch of top class projects in sustainability and innovation winning the 2018 Procura+ Awards. The cities of Barcelona (Spain) and Rotterdam (the Netherlands), and the Government of Flanders, were winners in their respective categories amid strong competition from other European cities, regions and national authorities. In a big moment for last night’s ceremony, Barcelona City Council scooped the top prize in Procurement Initiative of the Year, after the city made sustainable public procurement mandatory – efforts which will affect more than 50,000 tenders a year. Janet Sanz, deputy mayor for ecology, urban planning and mobility at the city of Barcelona said the city had been “evolving its strategy and policy on sustainable procurement for over 15 years”. And a 2018 municipal decree made sustainable procurement mandatory. “This covers EUR 1.1 billion of spending,” confirmed Ms Sanz. This year’s Innovation Procurement of the Year was awarded to the Dutch city of Rotterdam, which is pioneering the procurement of innovative goods and services to make the city more accessible for the elderly or citizens with special needs. Its efforts involve a multitude of local SMEs. Last night also saw the Government of Flanders take Sustainable Procurement of the Year – for setting up a major framework contract for sustainable office supplies. The administration set a target that “at least 50% of products meet sustainability criteria”, with a 2020 goal of 100% sustainable public procurement. “The Government of Flanders recognises sustainable and innovative procurement as a strategic objective,” said Liesbeth Homans, vice-minister-president of the Government of Flanders, as she welcomed the award. Other initiatives honoured at this year’s Procura+ Awards included the three runners-up that pushed the winners close. The city of Aalborg in Denmark ran a close second to Flanders in the sustainable procurement category, with Ireland’s Cork City Council runner-up to Rotterdam for its innovation procurement efforts. Meanwhile, Transport for London was pipped by Barcelona to the Procurement Initiative of the Year Award, following a successful training and skills programme for disadvantaged Londoners. Honourable mentions were also given to the city of Copenhagen for greening public transportation through innovation procurement, and to the Ministry of Labour and Social Affairs of the Czech Republic. The ministry is particularly active in making sustainable public procurement more mainstream in the Czech economy. This year’s EcoProcura conference, host to the Procura+ Awards, is being held in Nijmegen in the Netherlands. The conference series started in 1998 as a forum to “promote exchange and dialogue” on the latest strategies and practical solutions on “sustainable, circular and innovation procurement”. This year’s awards were supported by the Procure2Innovate project. Image copyright: Image (ICLEI Europe) by "Photo by Gerard Verschooten"
Public authorities and businesses from across Europe are invited to attend a live market engagement event on procurement needs and solutions for social responsibility and transparency in information and communication technology (ICT) supply chains. The event is set to take place 3 October 2018 in European Green Capital Nijmegen (The Netherlands), alongside the 2018 EcoProcura conference. Public authorities will have the opportunity to inform suppliers of their socially responsible procurement needs and upcoming procurement plans for ICT, which includes large contracts for smartphones, laptops and PCs, and servers. Suppliers will also have the opportunity to showcase solutions and initiatives that increase the social, ethical and environmental sustainability of their supply chains. The dialogue will help inform the design of procurements and contracts, and lead to suppliers submitting stronger bids. The event is taking place as part of the Make ICT Fair project, which aims to improve the lives of workers and communities associated with ICT supply chains, particularly in the Global South. To see a copy of the draft programme, click here. Participation is free of charge, but due to limited availability of seats, registration is mandatory. For more information and to register for the event, click here. 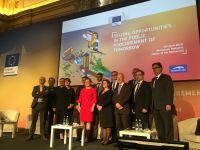 The first EU Fair and Ethical Trade City Award took place on the 27 June in Brussels to recognise and support local initiatives currently taking place in European cities to encourage fair and ethical trading practices. The City of Ghent (Belgium)was chosen by the expert jury as the award's first winner due to its clear commitment and long-term strategy for promoting fair and ethical initiatives. As well as supporting communities both local and global through its Sustainable Procurement Policy, Ghent has also hosted a range events promoting fair and ethical trade and procurement, such as the Fair Fashion Fest and EcoProcura. As winner of the award, Ghent will now have the opportunity to launch a development project of their choice, with €100,000 in financial support from the European Commission and technical support from the International Trade Centre (ITC), a joint agency of the World Trade Organisation (WTO) and the United Nations Conference on Trade and Development (IUNCTAD). The EU Cities for Fair and Ethical Trade Award is an initiative of the European Commission's Directorate-General for Trade (DG Trade), launched as a commitment of its "Trade for all" communication on trade and investment policy published in 2015. More information on Ghent's approach to fair and ethical procurement can be found on the Procura+ Network and the Global Lead City Network on Sustainable Procurement. Participants of the Procura+ Network are at the forefront of sustainable, circular and innovation procurement, and the 2018 EcoProcura Conference - which takes place in Nijmegen on 3-5 October - will be showcasing the activities and successes of Participants in several key places. As well as speaking in plenary and breakout sessions, Procura+ participants - who are eligible for a reduced event fee - will lead market lounges and other interactive activities, as well as using the chance to meet together on specific procurement topics. For example, a meeting of the Procura+ Interest Group on Socially Responsible Public Procurement of ICT will be held, alongside a market engagement event relating to social criteria for procurement of ICT products and services. The 2018 Procura+ Awards ceremony will also take place at EcoProcura on the evening of 4 October. The winners will be announced and the awards presented to public authorities for Sustainable Procurement of the Year, Innovation procurement of the Year and Procurement Initiative of the Year. The Procura+ Awards highlight sustainable and innovation procurements and tender procedures and give visibility to the most dynamic, forward-looking and innovative public authorities and their initiatives. Registration is now open for EcoProcura and can be accessed from the event website. When registering, please select 'Procura+ Participant' in order to receive discount. For more information contact the EcoProcura team at ecoprocura2018@iclei.org.